I've been having a recurring dream of sitting at the terrace of a cutre bar with no name on the corner of Via Laietana and Plaça Urquinaona. I drink a beer and people watch with the cast of characters I met living there as time passes slowly. Then I wake up at five am, until last week, go out in the snow flurries and ride a train for forty minutes to work at a nonprofit dedicated to youth, student & educational travel, WYSE Travel Confederation. In the streets of Amsterdam, I hear more Spanish than Dutch, loudly cursing the long winter that ices canals. ¡Joder! ¡Qué frio, coño! Most Spaniards seem to be recent university graduates looking for work. Some are street performers with long, dreaded mullets and their pack of mangy mutts, wagging their tails, happy, at roaming a new territory. In my office we've had three Spanish interns, two returned to Barcelona. They reported the experience helped them buck the odds and get decent jobs back home. The other, a Basque girl, stayed. She tells of the large Spanish speaking community in Amsterdam, many engineers waiting tables at the litany of Tapas Bars. She says, those who lack the English skills, look more and more to Latin and South America for an opportunity. None imagine going home anytime soon. The city where I live, Alkmaar, also celebrates a siege, every October 8th, when, in 1573, the city beat back the attacking Spanish forces, making the turning point in the 80 Years War. Victory is in the city´s motto, the name of its park. There is no national holiday or flag waving, just a fair with a carousel. The end of Nazi occupation is a day off every four years. I might be wrong. It might be five. My three floor townhouse sits where foreign invaders once camped, bogged down in the land flooded by Dutch Rebels. People in coffeeshops say you can hear the lispy ghosts of Spanish soldiers on a North Sea wind. Barça shirts decorate the bedroom windows of blond kids around me, along with wooden models of Dutch clipper ships. The second edition of the book is generating some positive reviews, (here, here & here about midway down). The general consensus seems to be that the stories show the dark side of Barcelona. I dunno. I'd say more gray. It's available on Amazon, but support independent sellers and visit Books4Spain.com. 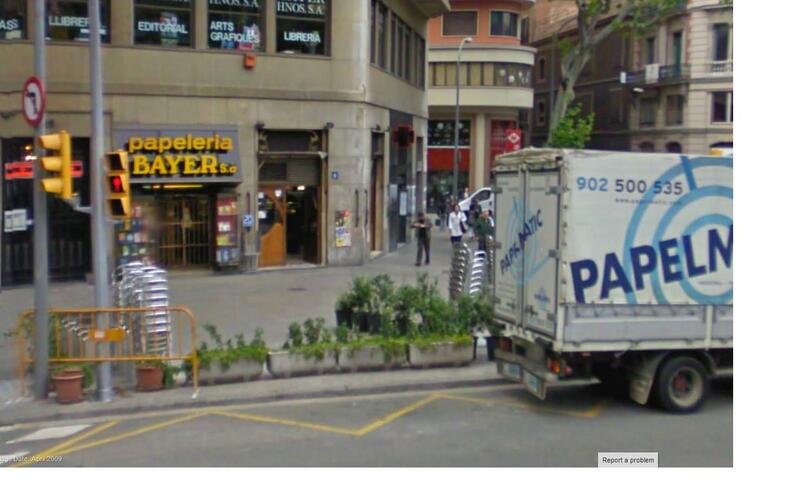 Sant Jordi is just around the corner after all. The sun is out for the first time in three days, the rays feeding the grass, currant bushes and flowers in the small back garden. I'm home on short vacation, my wife an daughter dancing the night away at La Feria in Sevilla until Saturday, as I recover from a bout of strep throat. Our cat, Rembrandt, soaks in the warmth near the patio door after a night spent carousing the hood. The big question today, just after the third anniversary of leaving Barcelona, is whether to ride my bike into Alkmaar and get a caganer tattoo on my left shoulder from an artist, hailing from Santa Coloma. For those of us who have spent an extended period in Barcelona, the city never really leaves us, even if we leave it. 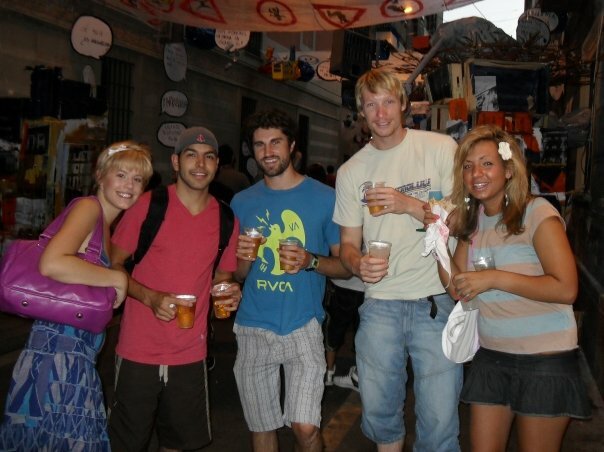 Guest blogger Ben Holbrook shares what he misses most about Barcelona now that it's no longer home...but for how long? 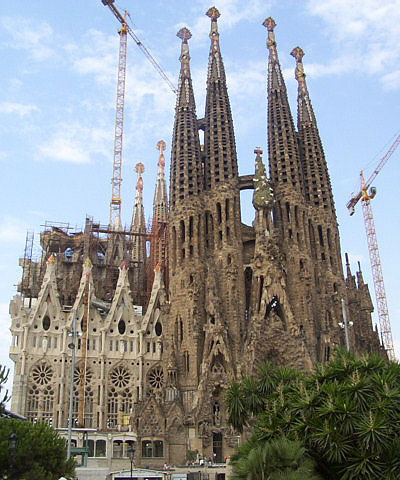 I moved to Barcelona in August 2009 and landed, miraculously, on Passeig de Gràcia in the scorching heat. I had one suitcase, zero knowledge of Spanish (or Catalan) and an un-quenchable thirst for adventure. Apart from my one month TEFL course, which started the next day, I had no plans apart from getting to know the city and perhaps to try and make some friends along the way. Richard, my contact and host for the month of August, met me and walked me through Gràcia to his flat whilst sipping on ice-cold Estrella Damm. It was beautiful and buzzing with life. People sat on the benches discussing life whilst youngsters moved slowly through the iconic, windy streets. It was the beginning of a two-year love affair, a period of time that was to change my life forever. I left the city, begrudgingly in the summer of 2011 and I have dreamt of returning ever since. Not a day goes past that I don’t find myself reminiscing about the amazing times I had in various parts of the city, and smile at how happy I was. Here are a few random things I miss and hope to one day live again. Venga, chicos! Vamanos! Random Moments of Spontaneity. I’ve never been one to spend time making plans, it’s a shame really because I know I could have got more out of my time in Spain if I had been more organised. 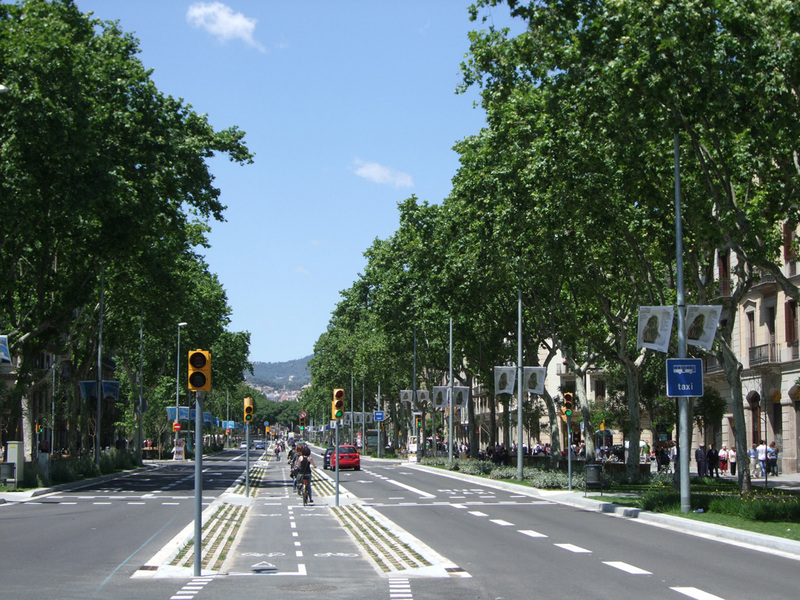 The truth is, however, Barcelona is a city where you simply don’t need a plan. In fact, I’d go as far as saying that you’d do better off without one. Without fail I’d spend every Sunday just wandering around the streets, getting lost in the Barri Gòtic, or El Bourn. I’d find street musicians playing beautiful music, sometimes Spanish style, other times it would be guys with didgeridoos and African drums, I loved the constant diversity. I’d stumble upon yet another quirky little cafe and treat myself to a cafe con leche and whatever they had on offer – it’d never cost more than a couple of Euros. I remember a huge group of people bursting into dance as a stage was setup down at Barceloneta beach, the band was clearly very famous and it was heart warming to see such joy in the streets. In fact, there was always some kind of stage being erected in one of the various neighbourhoods celebrating anything they could get away with. Apart from August, when it was far too hot to exercise outdoors (at least for me), I would spend all of my time cycling or running along the promenade by the beaches. I’d whizz down to the W Hotel, stopping only to watch the performers along the way or maybe to take a coffee, as they say in Spain. I also loved packing a bag with some sandwiches and walking up towards Tibidabo and Collserolla. It was always greener and cooler up there, and the views of the city were literally breath taking. I’d wait for the sun to go down and then run through the handsome streets of Eixample, past Sagrada Familia towards my favourite avenue in the whole of Barcelona, Passeig de Sant Joan. I’d take a breather, watch the old men play bowls and the youngsters trying their hand at table tennis. The weather allowed so much more freedom to get outdoors and to be active - I’ve never been as fit and healthy as I was in Barcelona. Naturally as with most people living in a new city, during the first couple of months living in Barcelona I spent a disproportionate amount of my time in bars. What struck me was the sheer volume of the crappy little granja bars on every street corner. The word means “farm” and they started as breakfast cafeterias where people drank the milk and dairy products of las lecherías. (Think a bakery, but for milk!) Nowadays, I guess they are the equivalent of the pubs that we have in Britain, many of the granja operators seem to have no desire to make it a special place, or somewhere you’d really want to spend an evening. They are always run by old men, and seemed to feature the same generic products. Estrella Damm on draught, red & white wine (house), cafe con leche, jamón and some random tapas that always looked like they’d been left out for the last month. These old man bars, in my mind, were perfect examples of function over form and I spent much of my time trying to avoid them. However, it’s hard to avoid them when they are located literally everywhere and occupy the best sunny-spots. I found myself frequenting them, for coffee breaks, for after work beers, for cheap and cheerful one-euro-Saturday-night-beers, for a quick bite to eat – for everything! And then I realised that these granja bars summed up everything I loved about the city. They’re not about indulgence, luxury, or being overly sophisticated – they’re about living simply, enjoying a drink here and a coffee there, on a daily basis. They made daily life enjoyable and affordable and that’s what I loved about Barcelona, it was a modest but wonderfully simple way of life. I’ll forever try to live that way and to be as happy as I was in sunny Barcelona. Ben now lives in London and is a writer for Hotel Club. He mainly writes reviews of the best and worst LondonHotels and is currently planning a dream trip to South America. Some of the Locations Featured in the Collection. 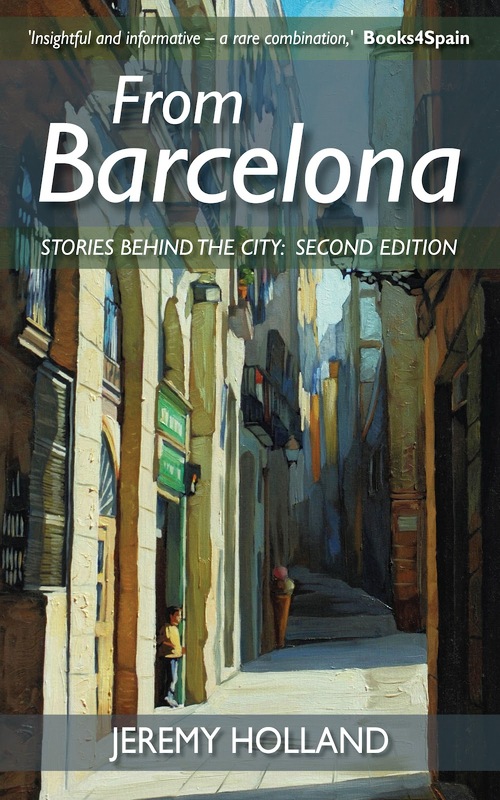 The Kindle version of From Barcelona came out today. Here are some images of some of the places featured. Based on friends' photos on Facebook it looks like everyone in BCN is starting to enjoy the summer and the music festival season. The weather is one of the many things I miss not living there. We've got a gale force wind and lashing rain in the Low Countries today. 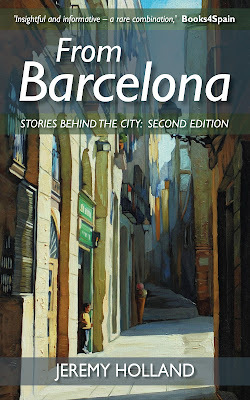 Anyway, I'm pleased to announce I found a new publisher for From Barcelona and a second edition is coming out in July. I was able to revisit the old stories with a more clear headed perspective and add a few new ones in, too. Here's a picture of the cover. Barcelona isn't Las Vegas or Monte Carlo which doesn't mean you can't test you luck and play games that might not make you rich, but could pay for a couple of drinks. Many bars and restaurants have slot machines, and in addition to that there is the famous Barcelona Casino near Port Olimpic. Unlike it's counter parts on the Vegas strip, there is no internet casino, which is probably for the best as the location offers visitors sea views, a discotheque, and a choice of restaurants: either a traditional casino buffet or Mediterranean cuisine. But of course, you don't go to a casino for the nightlife and unlike the slots you'll find in the restaurants throughout Barcelona, the casino offers games such as black jack, roulette (French & American style), plus poker to test your luck and win some serious cash. To play any of these games, you'll need an ID (preferably a passport) and to dress appropriately (no bathing suits, flip-flops etc). Just a quick note to wish everyone season's greetings. If I remember correctly, the mega bridge starting the season will be here soon and with it La Fira de Santa Llùcia (Lucia) located outside the Gothic Cathedral. One of my favorite Catalan traditions is the caganer. So much so he inspired a short story I wrote last year. You can read it here. Enjoy the festivities and stay warm. As some of you might know, I no longer call Barcelona home, having left in April for literally the greener pastures of Holland. It was a bittersweet decision because when I look back at all the places I've lived, Barcelona was the city I stayed in the longest - eight years! So, why did I leave? As with any major decision there were a variety of factors, most of which was brought about by the arrival of our daughter about a year and a half ago. The economy was of course one. Even in the boom years, the salary to hours worked ratio was never one of the city's top selling points, with ten hour days being the norm and 1,500 a month classified as well-paid. When we were just a couple, this didn't seem so important. We could live in a place without an elevator, go out with friends, travel, and enjoy all that Barcelona had to offer (concerts, beach, festivals). But without having any type of family support, this type of work schedule and wage makes raising a child there difficult and expensive. Plus, what's the point of having a kid if you're working and stressed all the time? The whole nationalist debate played a role too. We want our daughter to be proud of her mixed heritage, and unfortunately that's not the easiest thing to do in Barcelona given the political climate. The sad truth is: she'll feel more Spanish living in a small city in north Holland than a region of Spain. But, hey, that's why I don't live there anymore, because as Lou Reed sang, "I do believe, when you don't like things you leave for some place you've never gone before." So, after six months away, is there anything I miss? Absolutely, the beauty of the city and the people I'd met both in person and through this blog, the anarchic quality of the streets, the fish, those crazy Barcelona nights that end the next day. I don't miss the noise, though, or the congestion. It's nice having a tiny backyard even if it's the only place in Holland where grass doesn't want to grow. Would I recommend Barcelona? Sure, why not. Just do your own thing and try not to work for the man. There are worse locations to pass the time, but I can't think of many better cities to live in if you're single or with a significant other. It's stimulating and creative and just a special place. There's a reason why the city is called "that great enchantress" and I lived there so many years. I don't know if it's like this in other countries, but finding part time work in Barcelona is probably harder than landing a full time gig. Part of this has to do with the current economic environment, but mostly it's because the concept of flexible, part time jobs based on hourly wages, doesn't really exist here. Sure, companies offer part time contracts, but they're usually for twenty-five hours a week, the choice of afternoon or evening shifts being your only option. You will be expected to work these set hours regardless of work load and sometimes more because there's no time sheet to monitor when you arrive and leave, and thus no overtime. To avoid paying summer vacation, employers will often only offer these contracts for periods of less than a year, say from September to June, so you'll be responsible for saving money from your 500-600 euro-a-month paycheck for a summer, winter vacations. One of the problems I've had working on contracts, whether part time or full time, is that employers will often fiddle with the tax percentage, especially if you're hired during the year. This is often done without your knowledge and during the year it seems you're earning more, until April rolls around and you get a bill from the hacienda (tax department) saying you owe. Also switching jobs or going from part to full time or vice-versa will almost surely see you pay. It's almost enough to make a person decide never to file taxes ever again. But if you're only planning on staying a short time, part time contracts do offer the chance of a steady income that will leave you free in the mornings or evenings. Most of the part time job market requires Spanish and is concentrated on sales, promotions. If you don't have knowledge of the language, there are call centers and English schools that offer part time work. The best place to find out if a place is hiring is through the Metropolitan Magazine available in many English pubs or on Loquo. As I wrote in an earlier post, becoming an autónomo is also an option because it allows you to earn a decent hourly wage. But going through the process and paying the taxes really isn't worth it if you don't plan on staying for the long term. 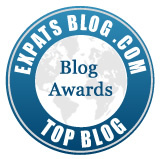 So what to do if you just want to earn enough to pay for your Barcelona adventure? Personally, I think the best option is to go black. I mean economically speaking, not in the choice of your clothes' color. I think I read somewhere the underground economy constitutes a fifth of the Spanish GDP and there's a reason; it's the only way to make a decent living for many people. Vast and covering almost every service sector, if you're fresh to the city and don't speak the language, there's the option of passing out fliers for one of the hundreds of bars competing for customers. I'm not sure how payment works, but people seem to get by and if often leads to other under the table promotional, bar work. Some restaurants might take you on and pay cash during peak months, as will smaller English schools but if all depends on how legal they are. If you like working with your hands, there is always boat work at the marina. But in all honesty, I still think your best option for working part time is to discover you inner entrepreneur and do you own thing. The arrival of June has already seen the temperatures rise and the humidity start. With air-conditioning in short supply here, the best way to escape the heat is to pack the sunscreen and towel and head to the beach. In Barcelona there are three main places to layout and bake before hitting a chiringuito. Starting with Barceloneta near the port, you can walk north to la playa Icaria by the Hotel Arts and Manfre buildings. Just beyond it is la playa Marbella, where you'll find the only nudist beach in the city. Not natural beaches, they were created as part of the Olympic games to offer those staying in the city easy access to the water, and on summer days they are often packed to capacity, so get there early. Also remember to be careful with your belongings. I have to admit with the change in temperature and the arrival of the sun after a long winter, I find my desire to sit in an office and blog about as high as going to work on a Monday morning with a hangover. There are too many things I'd rather be doing such as attending the II Gran Pinchada Surf and Roll which takes places at La Cervecita tonight and night starting at seven there's a spring festival at Plaça Sant Pere in El Born. Barcelona really comes alive over the spring and summer months with events such as these, in addition to neighborhood parties, concerts and the like so I feel a bit sad sitting at home when I could be outside enjoying life. So as with last year, light blogging through the summer months. I'll try and compile a list of neighborhood parties with their dates for anyone interested. There are so many it's by no means easy, so if you know of one, please let me know. In the meantime, enjoy your days wherever you are!